Charcoal toothpaste has become fashionable in recent times. Activated charcoal (carbon) is a fine black powder produced from heated coconut husk, bamboo, wood or coal. Advocates of charcoal toothpaste suggest it naturally cleans, polishes and whitens teeth by removing toxins. 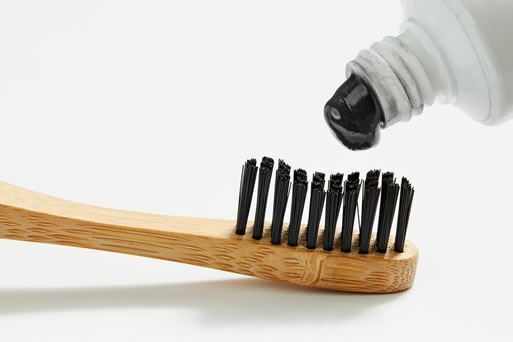 A recent literature review¹ by the University of Maryland, published in the Journal of the American Dental Association, reviewed 118 medical articles examining charcoal toothpaste. It concluded that there is no evidence that charcoal toothpaste can whiten teeth and many products make unsubstantiated therapeutic claims such as oral ‘detoxification’. Charcoal toothpastes have large particles which make it ‘gritty’. This means the toothpastes are abrasive and may remove surface staining but could also damage enamel (the hard outer layer of a tooth). Damage to enamel is irreversible and could result in the opposite effect of whitening as thinner enamel means the underlying yellow dentine is more visible, darkening tooth colour. Bleaching products used by dentists contain carbamide peroxide. This removes deep and surface stains from the teeth and has been tested to a high safety standard (there are thousands of peer-reviewed, published research papers internationally²). We recommend having a chat with your dentist before using dental products containing charcoal. Charcoal and charcoal-based dentifrices: A literature review. Brooks JK, Bashirelahi N, Reynolds MA. J Am Dent Assoc. 2017 Sep;148(9):661-670.